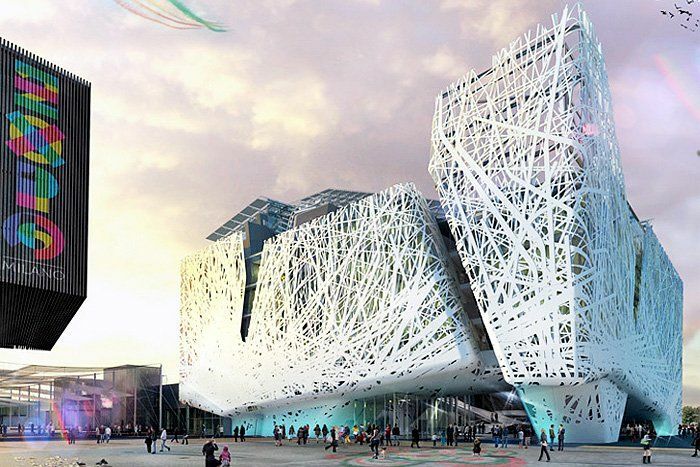 At last, it is time for Expo Milano 2015, the largest global event dedicated to food. “Feeding the Planet, Energy for Life” («Nutrire il Pianeta, Energia per la Vita») is the theme of the event: a reflection on the key role that nutrition plays on the development of humanity. As many as 145 countries are participating, with their cultures, traditions and projects aimed at addressing future challenges for a more balanced eco-friendly redistribution of food resources. If you would like to discover what’s happening around the world and let yourselves be tempted by the colours, scents and flavours of food, this is a unique opportunity. Twenty million visitors are expected. You have until October 31st to make this journey. Here are some pictures of the 10 pavilions/countries I selected to tempt you into visiting. The host country has the largest pavilion in the Expo and it highlights Italian excellence: the culture and traditions linked to cooking and food, characterized by the quality of raw materials and finished products. Its theme is “The Nursery of Italy”, which symbolizes the nurturing of projects and young talent. The Belgian pavilion highlights the country’s environmental sustainability, technological innovation and national identity. Products such as Belgian chocolate, Belgian fries as well as traditional Belgian beers will be on offer there. The Chinese pavilion, whose theme is “Land of Hope, Food for Life” is shaped like wavy wheat. It presents the agricultural history and food culture of the Asian country as well as its expectations regarding the future of the world. The theme is “American Food 2.0”. The “Food Truck Nation” proposes among other things, a series of food trucks serving iconic and innovative regional American foods and beverages. “Different Ways of Producing and Providing Food” is the theme presented in a fully recyclable pavilion made of Jura wood, which can be dismantled and sold for reinstallation elsewhere. The visitor is immersed in a powerful visual experience that illustrates a wonderful journey through its agricultural engineering with a look into the future of mankind. Not to be missed: the 70-metre long and 12-metre high vertical garden. “Harmonious Diversity” in a building made of natural materials such as bamboo and wood. Events and installations stimulate the five senses, allowing visitors to fully experience Japan’s food culture. Water, agriculture and energy are the biggest challenges that Kuwait has to face to ensure a better quality of life aligned with sustainability. The structure of the pavilion resembles traditional Kuwaiti boats. “Grown in Britain: Shared Globally” is the theme developed in a hive-shaped pavilion. We can see the new achievements and innovations reached in each stage of the food chain, from seed to plate, from field to table. The Swiss pavilion is made up of four towers, full of local food products that the visitor can take away. But there is a limit to the resources available… to exceed that limit is to deprive other visitors of the same opportunities. If you are wondering why I have not shown Canada, the reason is simply because… Canada is not taking part in the Expo. The explanation: the return to fiscal balance, because this gigantic global showcase is clearly not profitable in the short and medium term for the country. At least, according to our government. I’ll let you draw your own conclusions, but more importantly, I invite you to visit the Expo.